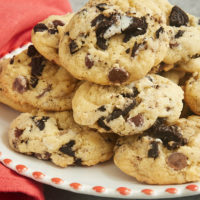 If you’ve spent much time browsing the recipes here at BoB, you’ll know that I have a weakness for certain ingredients. 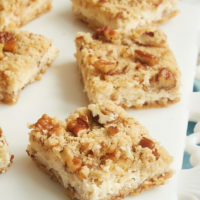 Two of those are cream cheese and pecans, which are both wonderfully represented in these lovely Pecan Cheesecake Bars. 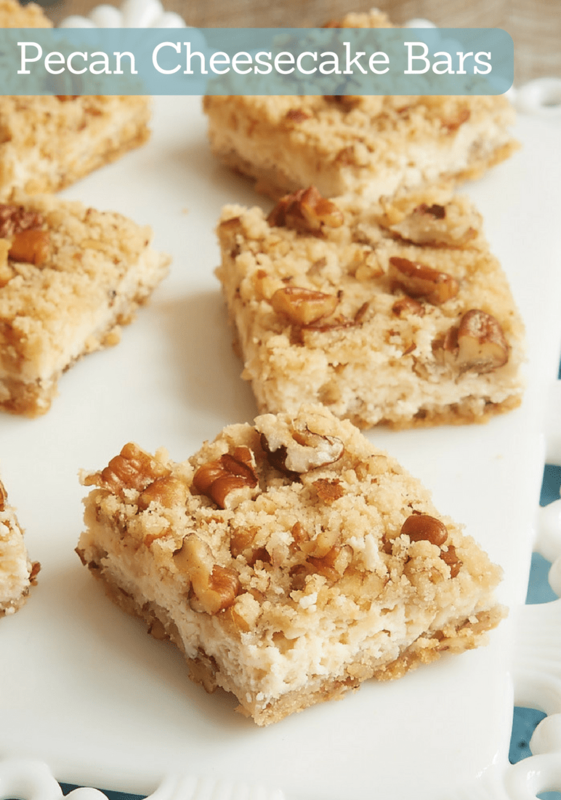 I first made these Pecan Cheesecake Bars way back in the early days of BoB, so they were definitely due for an update. The original recipe is so good that I don’t alter it much. I like to add just a bit of salt to the crust and topping. That is, of course, optional but I really like that little salty bite it adds. I recommend chopping the pecans fairly well so that they’ll mix well with the rest of the crust and topping mixture. 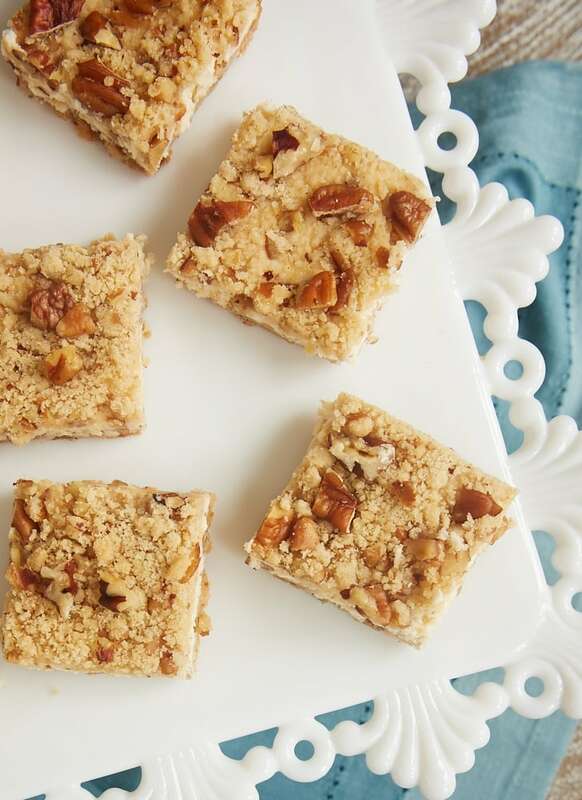 If you like, coarsely chop a few more pecans to sprinkle over the top of the bars. It’s not a necessary addition, but it’s a nice aesthetic touch. There are plenty of simple variations you can try as well. 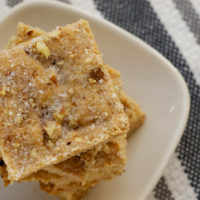 Substitute another type of nut for the pecans if you like. 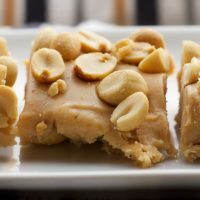 Hazelnuts, almonds, macadamias, and more would be great choices. 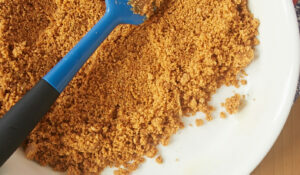 If you’re a cinnamon fan, try adding 1/4 to 1/2 teaspoon of ground cinnamon to the crust and topping mixture. Or how about a little orange zest in the filling? So many possibilities! 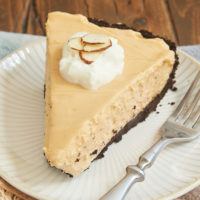 This recipe is a great go-to when you want a dessert that is super easy to make and has wonderful flavor. 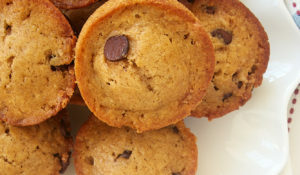 With a short list of ingredients and very little prep time, you’ll have these beauties baking in short order. 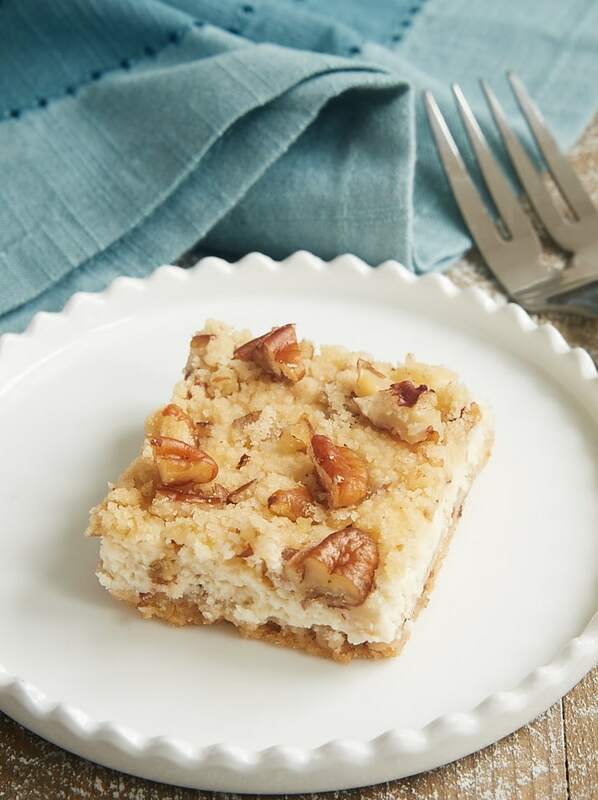 Pecan Cheesecake Bars are a delightful dessert that can be made quickly and easily. A great go-to recipe for a simple dessert without a lot of fuss. Combine the flour, brown sugar, and salt in a medium bowl. Add the butter and mix with a pastry blender or your fingers until the mixture forms crumbs that hold together when pinched. Mix in the pecans. Set aside about 3/4 cup of the crust mixture to use for the topping. Press the remaining crust mixture into the bottom of an 8-inch square baking pan. Bake 12 to 15 minutes, or until lightly browned. 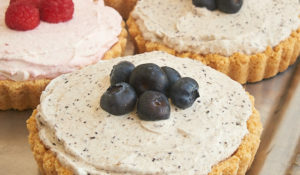 Using an electric mixer on medium speed, beat the cream cheese, sugar, milk, and vanilla until thoroughly combined and smooth. Spread the filling mixture evenly over the partially baked crust. Sprinkle the top of the filling with the reserved crust/topping mixture. Lightly press the topping into the filling. Bake 30 to 40 minutes, or until the filling is set. Cool completely. Cover and chill for at least an hour before cutting into bars. Recipe slightly adapted from Land O’Lakes. These look yummy. Can’t wait to try them. 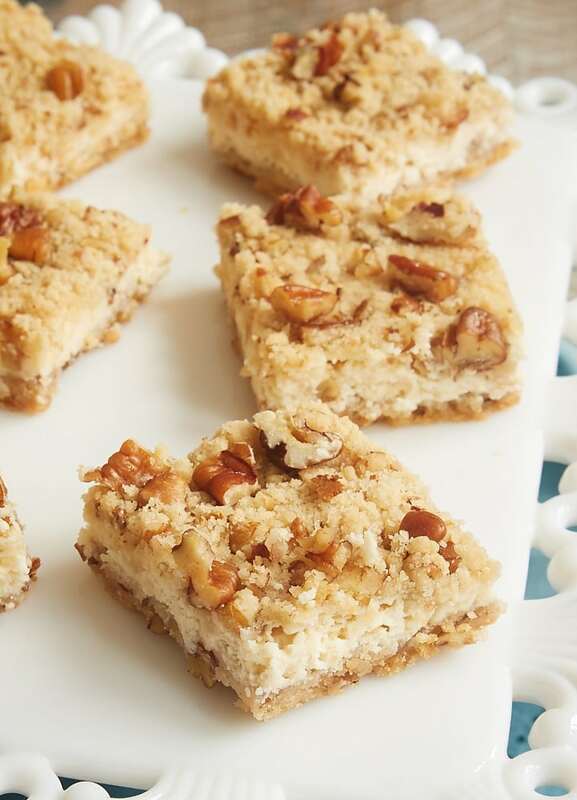 Hey these pecan cheese cake bars are delicious. Thanks for sharing the recipe. I made these for Bunco and we nearly polished off the pan. Husband and son were very sad-faced that so few bars were left … so I’m making them again tomorrow! They are delicious! That’s great to hear, Kim! These are amazing! I ate them for lunch the day I made them, and need to make more just a few days later. I love them, too, Barb. So easy and SO good! hey Jennifer…! 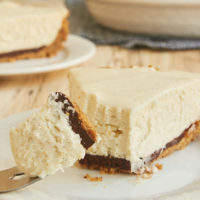 amazing your cheesecake bar and looks too delicious and yummy & i will tried to make it like you. thanks for this sharing and keep shared your new ideas & recipe….! 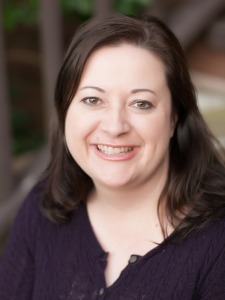 hi Jennifer….! 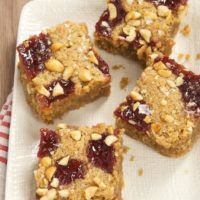 am also reads your post but this is one of my favorite recipe….and looks so yummy and delicious….thanks for sharing this amazing recipe….! Perfect combination of flavours ! Thank you so much ! Wish they wouldn’t comment until they try recipe.